There is a national campaign that is currently being sponsored by a big steakhouse chain. For a measly $15, a person can get a four-course meal consisting of soup, salad, entrée, and dessert. I used to spend $15 on a meal without batting an eye, but nearly four years of unemployment tends to make a person a little bit more conservative. These days, I only spend that much if I can get some extra bang for my buck. This particular offer, however, offers a lot of bang. Last week Fluffy went out and got us two $15 meals from the takeout menu. We had soup, salad, and carrot cake for dinner on the first night. It was all we needed. The salads were huge, and the clam chowder made at the Outback is stellar. We probably could have done without the dessert, but it was there and we ate it. The next night our dinner consisted of my chicken chest and baked potato and Fluffy’s shrimp brochette over rice. After that we had three additional meals. Fluffy’s baked potato was one of them, and the other two were lunches Fluffy made by melting cheese over the two little loaves of bread that came in the sack. All in all, those two four-course dinners provided four dinners and three lunches for our household. We decided the money was well spent. When the offer was first launched, Fluffy and I took a lady we home teach to the restaurant, and the three of us dined together. Once again, Fluffy and I ate our salad and clam chowder and had everything else boxed up to take home. We were in the minority. The restaurant was crowded because of the special offer, and we saw few people carrying take-out bags as they left. Most of the people who took advantage of the special packed in the whole four courses, taking home with them only what they carried inside their persons. Fluffy and I watched this and marveled. “Why are we the fat ones?” we asked. When asked why he was planning to climb Mount Everest, George Herbert Leigh Mallory is purported to have said, “Because it is there.” He and his climbing companion vanished on the Northeast Ridge back in 1924, and their bodies were not discovered for another 75 years. 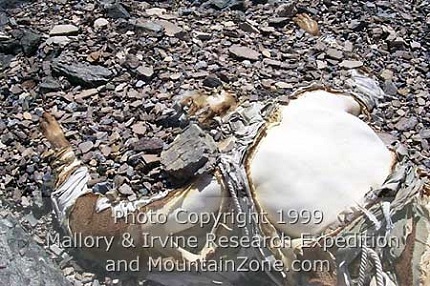 The body of George Leigh Mallory, photographed Saturday, May 1, 1999 at 27,000' by members of The Mallory & Irvine Research Expedition, illustrates the folly of doing something just because you can. Even though Mallory’s example should have shown us the folly of doing something just because we can, I think many of us in this land of plenty take his approach to life. If we fall in lust with a car, we buy it despite our inability to afford it, just because financing makes it possible for us to do so. We may purchase more jewelry than any human being can possibly wear. Why? Because it’s there on eBay or on the home shopping channels to purchase without our even have to visit a store. Or we order a four-course meal and eat the whole thing just because it’s a good bargain, never considering that nobody but a sumo wrestler or a crab fisherman needs to consume that amount of food in a single sitting. Anyone who has the technology to read this is obscenely wealthy compared to people in many parts of the world. Do we recognize how fortunate we are, or do we long for more? It’s so easy to fall into the “poor me” trap when we can’t afford a new coat for the winter, even though the one we have is perfectly serviceable. When being on a budget means we can’t go to the movies or eat in restaurants or travel as often as we like, the tendency toward self-pity is strong. A friend of ours, Diana “Wonder Woman” Woodruff, recently moved to Nigeria with her family. She quickly learned that the things she threw away were considered to be treasures by the local population. She recently wrote an essay about it (One Man’s Trash is Another Man’s Treasure), where she estimated that everything she threw out—from poopy diapers to rotten food—was handled by at least seven groups of human beings, who looked through every single item to see if it could be reused in some way. A real eye-opener for her was a fight that broke out between two sets of people who wanted the crates that were used to ship the family’s belongings overseas. As it turned out, the people wanted to use these wooden crates for houses—not for dogs or for chickens, but for their families. Here are some Nigerian houses Diana found that were made from shipping containers. When I think of people living in those conditions, any anguish I have over my inability to furnish our bedroom becomes laughable. 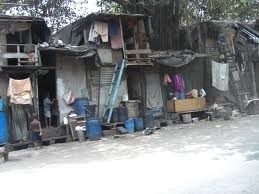 How can we be so fortunate, when people all over the world don’t have walls in their homes or food in their stomachs? I’m not saying we should feel so guilty that we can’t enjoy what we have. But I do hope that sometimes as we think of our blessings, we feel overwhelmed with gratitude for the good things we have been given. We weren’t given these things because we deserve them more than other people. We were given them for reasons I can’t even fathom. Rather than feeling pride because of our riches or envy because we aren’t as rich as the people next door, we should feel profoundly grateful that we have been blessed far beyond measure. If we have that air of humble gratitude, perhaps we’ll take our surplus and use it to help the people around us rather than using it to increase our own inventory of stuff. After all, the treasures of life can’t truly be enjoyed if they are hoarded. On the contrary, they are always sweetest when they are shared with others.